Boston has a very historic waterfront. There are four hotels along the downtown shoreline. From north to south, there is the Fairmont Battery Wharf, Marriott Long Wharf, Boston Harbor Hotel, and Intercontinental Hotel. The hotels rate from three to five stars, and are located along the shore and within walking distance of many important parts of downtown Boston. There is great history associated with Boston Harbor. During colonial days there were large fishing fleets based in Boston, and significant exportation of goods to Europe. By the end of the industrial revolution, huge merchant and passengers shipped helped make Boston one of the largest ports in the United States. 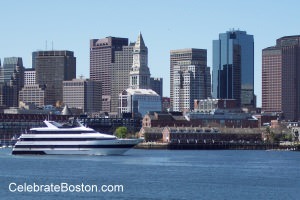 Today, the waterfront is a famous tourist attraction, with many people visiting the various restaurants and hotels, enjoying free entertainment at several venues, take a water taxi over to the airport, or voyage out of Boston Harbor for a cruise. The Fairmont Battery Wharf is a beautiful hotel located in the North End of Boston. The North End is predominantly an Italian-American neighborhood, with street festivals taking place each summer known as "feasts." St. Anthony's and the Fisherman's are the most popular feasts each August. TD Garden is within walking distance to the north, and Long Wharf and Quincy Market are not far away in the south. Of historic interest, the hotel is located in one of the oldest sections of the city. In colonial days, there were pirate and smuggler tunnels constructed in the North End, which were reportedly put to use all the way into the Prohibition days of the 1920s. The Marriott Long Wharf Hotel is located in the heart of the waterfront. The building is constructed of brick, and was designed to resemble a large ship itself. Just outside the hotel is the berth for the water shuttle to Charlestown; where the USS Constitution is docked. Codzilla and New England Aquarium are also just outside the hotel. One can exit the hotel, walk across Atlantic Avenue and the Greenway Park, and enter the expansive Faneuil Hall Marketplace shopping and eatery complex. Boston Harbor Hotel is a beautiful building located a few blocks south of the Marriott. The structure has a tall central arch that is a gateway or welcome symbol for ships entering Boston Inner Harbor. The building is best viewed from the Fan Pier, which is located on the opposite side of Fort Point Channel. The hotel offers free outdoor entertainment each summer, with the Blues Barge music performances, and Movies By Moonlight film series, both being very popular. The Financial District is within walking distance up High or Broad Streets. Intercontinental Hotel is an architecturally pleasing glass-clad building located along Fort Point Channel. It is also best viewed from the opposite side of the channel near the Children's Museum. The structure looks different depending on the angle of the sun or various cloud covers. It has broad glass-clad arches that make the hotel look much different depending on the place of viewing. South Station is a short distance away, with the Financial District located up Oliver Street. Chinatown is also within walking distance. What is cool about Boston waterfront hotels is access to a walkway known as the Harborwalk. Visitors can walk from the Seaport District in South Boston along the shore, uninterrupted all the way to the Charles River in the north. The centerpiece is Christopher Columbus Park, location of free summer entertainment and the Boston Arts Festival in September. Well, if you enjoy the salt air and watching the ocean, there are four hotels along Boston's Waterfront. The Fairmont Battery Wharf is often rated the highest, with nearby access to the North End and Italian cafes. The Marriott is most bustling with tourists and can even be considered popular for that reason. Boston Harbor Hotel is considered upscale and romantic, with the Intercontinental being the newest edition of the four. Area: Waterfront, Map Pin "A"
Area: Waterfront, Map Pin "B"
Area: Waterfront, Map Pin "C"